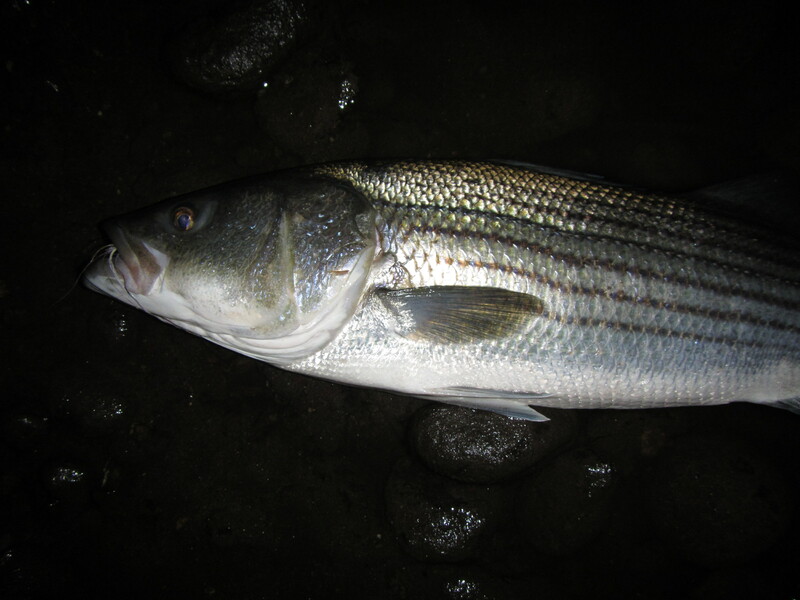 Small Stream 101: Fishing the outgoing tide. The brook was dozens of miles from the sea. Yet there I was, fishing the outgoing tide. At least that’s what I started calling it several years ago. Let me explain. What I mean is, I’m fishing a small stream in the day or days after a heavy rain. As with an ebbing tide, the water level is dropping. It’s a great time to fish. Here’s why. The waters have gone from raging and murky to some semblance of normal. They may still have a light tea stain to them, which makes it a little harder for the fish to see you, but not your fly. Most of all, the trout have transitioned from hunker-down survival mode to dinner bell-ready. That was certainly the case today. I would crawl on my hands and knees through a skunk cabbage-filled boggy mess to catch a wild brookie like this. Oh, wait. I did. The lovely woodland stream I visited today is one I haven’t fished in many months. I usually make a pilgrimage in April, but the time-space fishing continuum conspired against me. The woods are only starting to display a vague suggestion of green in April, but on May 31st they were lush. 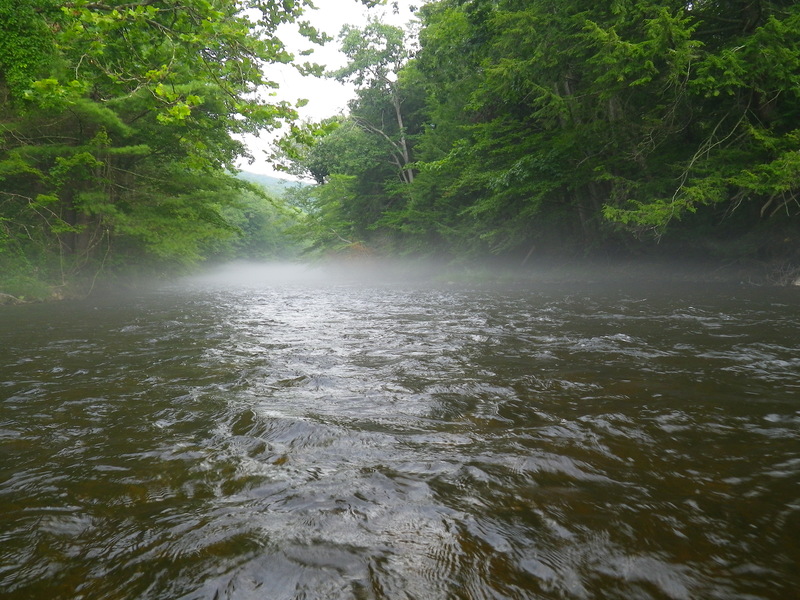 It was already too hot and humid to be bushwhacking in waders at 8am, and non-biting midges swarmed me. Such was the price of admission for the wild troutstavaganza. 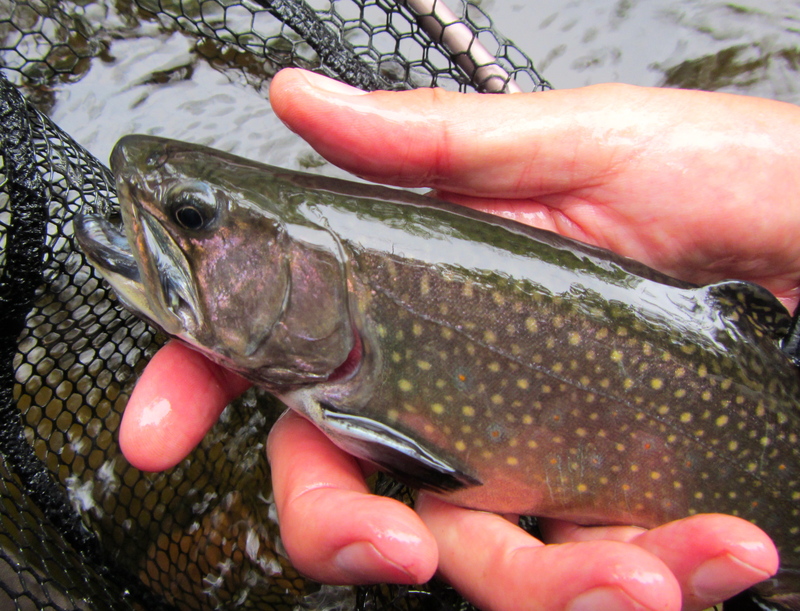 There were fish everywhere, with plenty of young-of-year brookies in the mix. This is always a good sign, as 2012’s new recruits will be 2015’s lunkers. It’s especially gratifying to see nature finding a way after last year’s terrible late summer drought and heat wave. 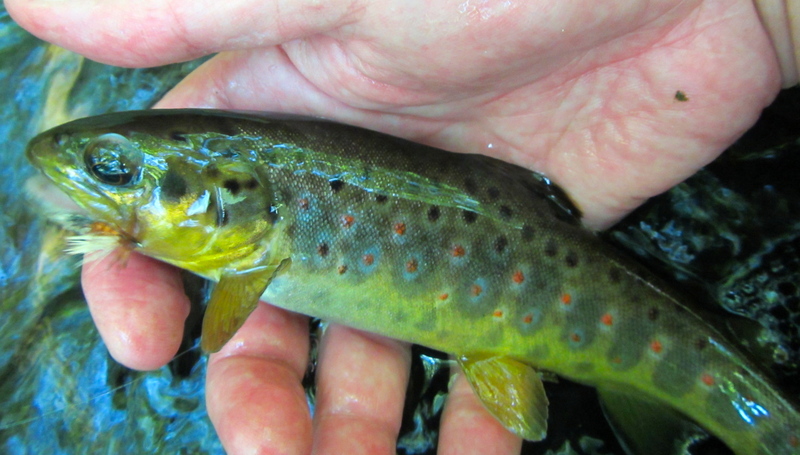 This blindingly beautiful wild brown hit the dry like a ton of bricks. Excuse me for a minute. I’ve got to wipe away the drool I got while gazing longingly at those parr marks. The fish were particularly active today. I witnessed three good-sized (for this stream — it’s small enought to jump across in more than one spot) trout feeding on the surface. 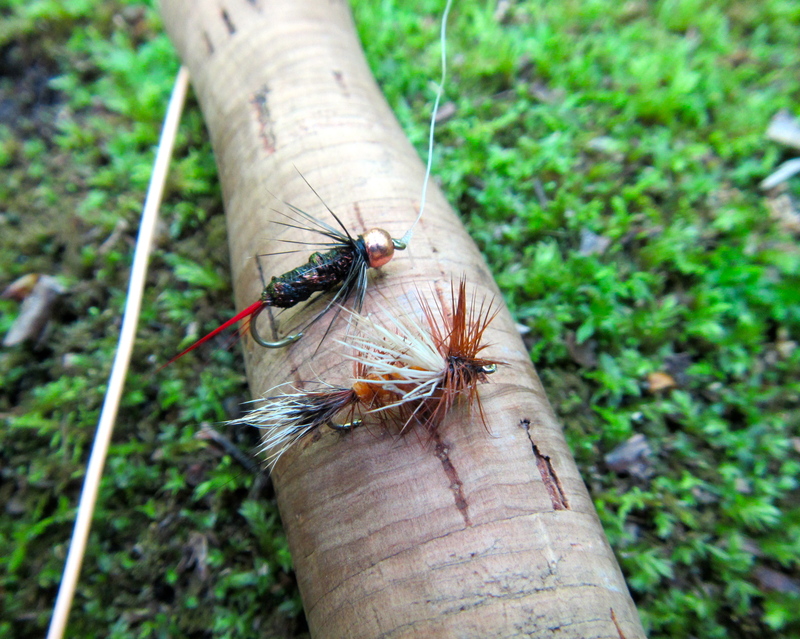 Two were noisily slashing at emergers; the third was clearing the surface as he chased caddis. All of them were camera shy. Every time I tried to shoot some video, they suddenly stopped feeding. Little bastards. Fished a new dry today, the (Improved) Sofa Pillow in a size 16, along with a bead head Grey Hackle Peacock. The dry got the lion’s share of the action, fished mostly upstream. Pricked a good couple dozen trout, and lost many of them when the hookee ran into the omnipresent underwater stick pile. These twig and branch masses were everywhere. One of the pitfalls of fishing right after a big storm. Today’s implements of destruction: A bead head version of the classic wet, the Grey Hackle Peacock, and the (Improved) Sofa Pillow. I held out on the cigar for as long as possible, but eventually the midges tipped the scales. Nonetheless, I declared victory as they scattered. Thank you, Romeo & Julieta Havoc Magnum. Besides, I managed to ignore work for the entire morning while catching wild trout. Clearly, that makes me the winner. How does a stream stay cool in piss-stinking hot weather like today’s? Canopy. This photo was taken at high noon, yet virtually the entire stream is covered in shade. Nature finds a way. UConn wants to divert 5 million gallons of water a day from the Farmington River. What can you do about it? Start here. Yes, the same UConn that drained the Fenton River Class 3 Wild Trout Management Area dry a few years back, killing hundreds of trout. They’re up to their greedy, water-sucking ways again. Only this time it’s the Farmington River they’re after. Yep, the same Farmington River that had lethally low flows last August, killing scores of fish. But, what’s another five million gallons a day in the name of progress? So what if we have to build a pipeline halfway across the state? Who cares if more fish die, or if people can’t fish or kayak or float, or if businesses that depend on the river suffer? If you do care, please sign this petition. Pass it along to a friend. The future of the Farmington remains cloudy. 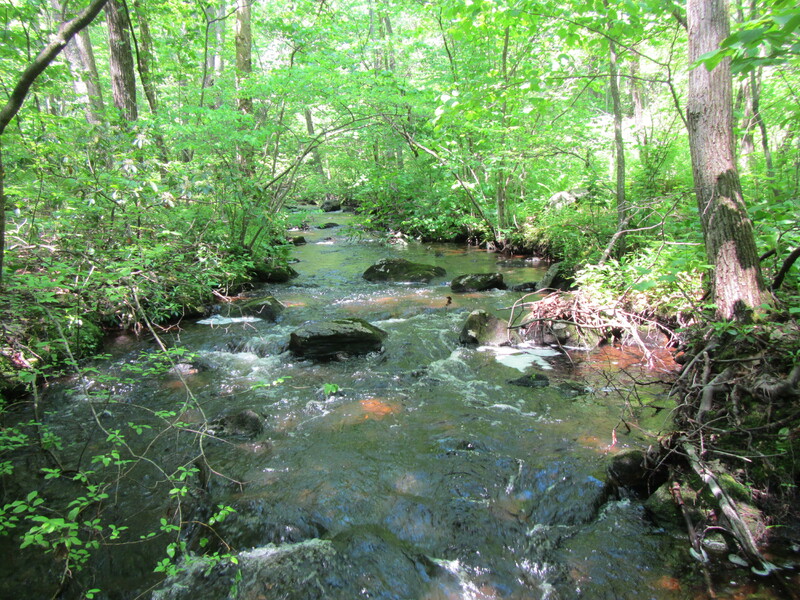 Help send a clear message to UConn and the MDC: Leave our river alone! On Thursday night, the Farmington crested in the upper TMA at around 1,500cfs. By this afternoon, is was still pumping out 750. Winds were gusting to 30mph. What a great day for some streamers. I felt like fishing something new, so this morning I went down to the bench and pulled out a size 6 streamer hook. Since I didn’t know how much the water had cleared, I went for high-visibility. On went a gold bead, seated with some heavy wire. Made a tail out of marabou and gold Krystal flash, a body of gold mylar braid, and a doubled white marabou collar as long as the fly. On top, some silver Krystal flash. Any self-respecting ambush predator should be able to see that. Line choice was a bit of a puzzler. I hemmed and hawed, and finally decided to go with an integrated full-sink tip, not so much to get the fly down — that would certainly be welcomed in areas where the current slowed — but mostly for casting in the banshee wind, and to keep the line below the flotsam that was sure to be bobbing merrily on its way downriver. Yowzah, it was cold. I immediately regretted leaving my fleece vest in the truck. The wind chill had to be in the 40s or 30s. Some pinhole leaks in my waders and 53 degree water certainly didn’t help. But at least I was no longer slinging mulch in my garden. Even if I was able to do that in the comfort of a t-shirt. The river was off-color, more of a tea-stain than muddy. As I suspected, lots of leaves/branches/twigs combos in the water. There were bugs out, but their presence was mostly belied by the legions of swallows working overhead. And yes, there were trout. I spent most of my two hours working the banks, casting and stripping in short bursts. In my first cycle through the run, I took four browns and dropped a couple more. The trout weren’t particularly big, but most of them were chunky holdovers that fought well in the current. (Sorry, no pictures. Left the camera at home. Too cold/lazy to get the iPhone out.) I had a few swipe, miss, and come back for seconds. That’s always good for a thrill. Dropped a handful more on my second and third go-rounds, and that was it. Pretty soon it will be time for streamers under cover of the night. And if I’m lucky, I’ll be fishing in shirtsleeves. I had the pleasure of guiding Paul for four hours today on the Farmington River. Paul told me he wanted to concentrate on fishing streamers, so we set off for the upper TMA rigged with a beadhead black and grey bunny thingy fly. 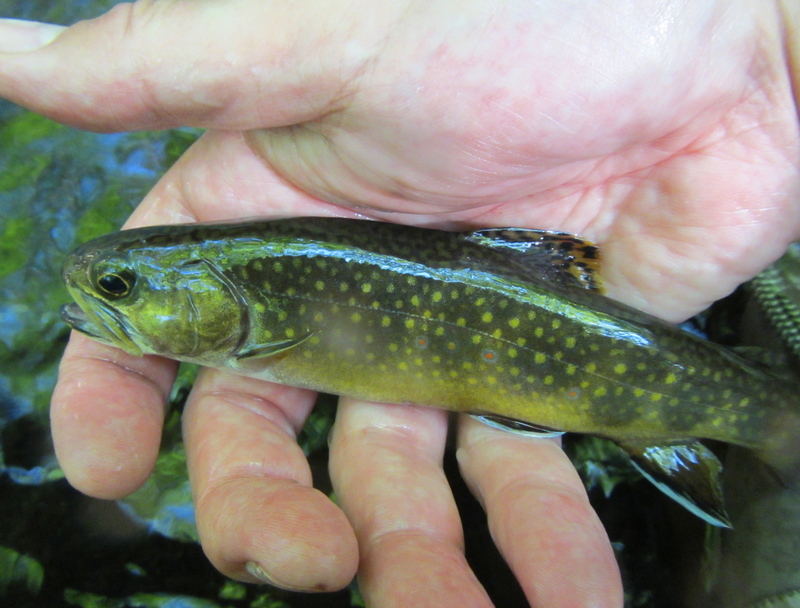 Believe it or not, before today Paul had never caught a brook trout. We took care of that in the first half hour with a kype-jawed buck. The size of the fins on this brookie lead me to believe that he’s lived in the Farmington his entire life. Today the trout took the fly on the dangle and on the strip. It rained on us, but we both found it relaxing and beautiful. Either way, it beats sitting at a desk. Adding a couple more notes: water was about 430cfs (that figure has gone way up with the afternoon rains), lightly stained, and temp was low/mid-fifties. Very little in the way of hatch activity: a few clunky light colored caddis and a smattering of tiny BWOs. We saw only one rise. Many thanks to Mark, Ron, and Ted for taking my Wet Fly 101 class yesterday. We had excellent weather and a good group of anglers who came loaded with questions. 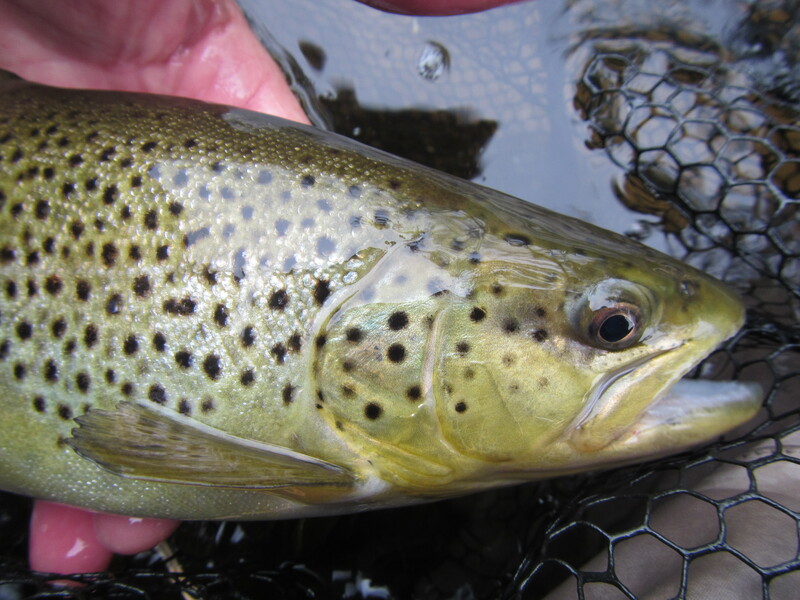 Unfortunately, we didn’t find too many cooperative trout (I found the wet fly fishing to be slow on Friday, too). But the day will come when those bashful fish be racing to get to that soft-hackled fly, and then it will all fall into place. We learned some new water, and plenty of new fishing tactics. Thanks again, guys. Spent a few hours today doing some advance scouting for Saturday’s wet fly class. Found fish everywhere I went. Gloriously alone today, but that won’t be the case on Saturday. Water was a crisp 50 degrees, skies overcast, and a few showers here and there. We need more rain than this. Not a lot going on bug or rising fish-wise, but I did see some light tan caddis, about a size 16, a few lonely Paralepts, and mounds of miniscule midges. I was fishing a Squirrel and Ginger as the top dropper, Leisenring’s classic Iron Blue Dun in the middle, and a black bead head grey soft-hackle nymph on point. The trout were split right down the middle, half of them on the Squirrel and Ginger, half on the point fly. They took the fly with gusto. Powerful, demonstrative hits. 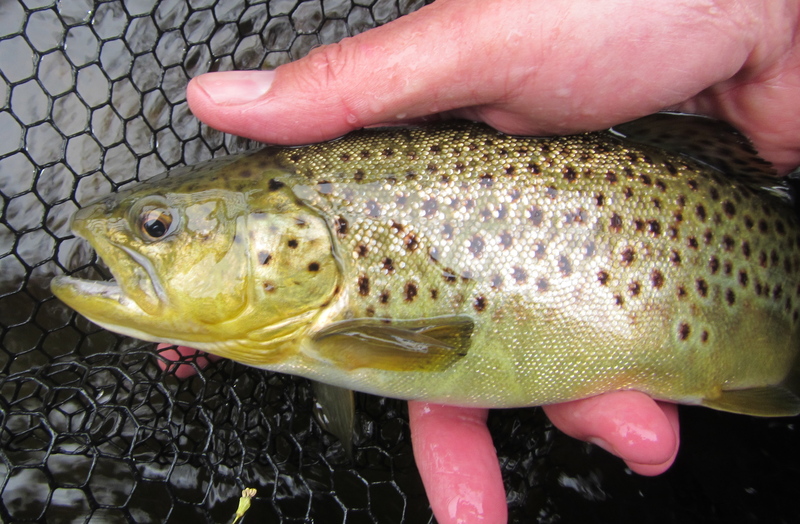 A lovely Farmington River holdover brown that took the top dropper, a Squirrel and Ginger, on the dead drift. Two trout of note. The first came where a riffle dumps into a long, deep pool. I was being lazy, mindlessly fishing wets downstream, when I looked above me and saw this pocket that I’d swung flies through a thousand times before. I made an upstream cast to it, letting the flies dead drift, when I saw a trout flash at an emerger just below the surface. Just as my brain was forming the thought, “Must cast there again,” I realized the emerger was my Squirrel and Ginger. It was a handsome holdover brown, metallic and buttery. A little farther upstream, there’s a sapling that hangs over the river like a drunk caught in mid-stagger. Its branches drag in the current, and the shade from its leaves clouds the already mysterious waters beneath it. It’s one of those spots where there’s always a fish. But not today. Well, not on the upstream side. Just below, whack! This brown did her finest impersonation of a steelhead, cartwheeling out of the water multiple times. I could see it wasn’t a big trout, but I almost put her on the reel. Up and down the pool she went. Foul hooked, I wondered? Nope. Just a fat, obstreperous holdover brown, about 14″, with the Squirrel and Ginger lodged neatly in the corner of her mouth. For a moment, I considered putting her on the reel. She had some shoulders, this one. Now, if the trout will only cooperate Saturday. 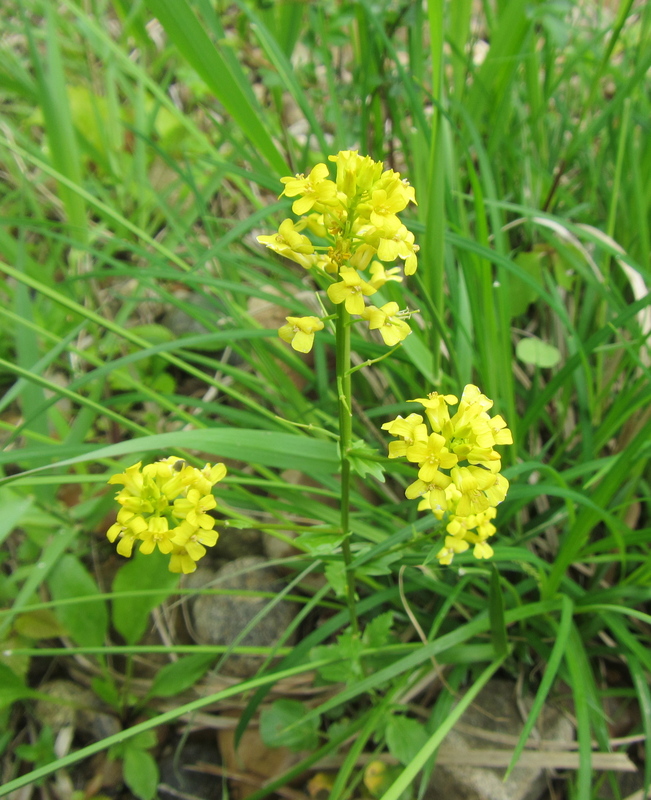 It’s wildflower season on the Farmy. I don’t know what these are, but they’re everywhere.